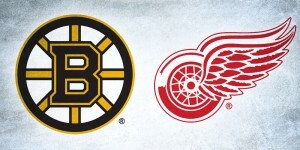 Spring is finally in the air, which can only mean one thing (well, two); the Stanley Cup Playoffs are back, and the fifth annual Bucket Bracket Showdown is underway. Our 2018 champion Braden Holtby is back to defend his crown against some familiar foes and some Bucket Bracket newcomers. Like in past seasons, we’ll be pitting the starting goaltenders’ masks up against each other in matters of branding, composition, and overall aesthetic value. 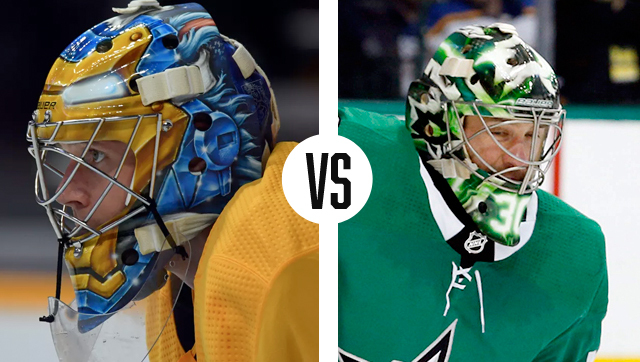 Will the best masks win on the ice? 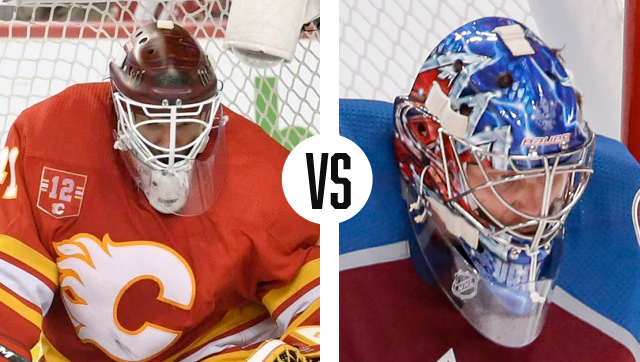 That we can’t tell you, but let’s take a look at how each series would play out in a battle of bucket supremacy. 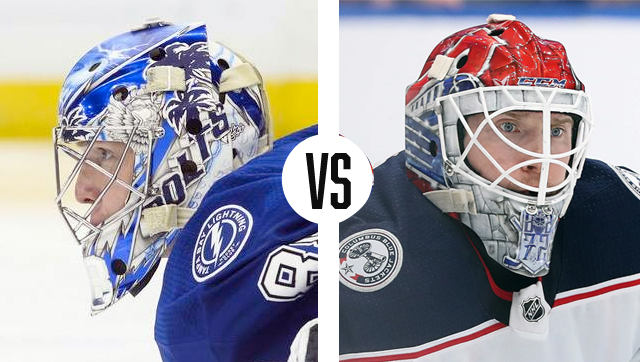 For the first matchup in this year’s showdown, Vasilevskiy and the Presidents Trophy-winning Lightning take on Bobrovsky and the Blue Jackets. Last year, Vasy’s Sylabrush bucket got an easy win in the first round against Keith Kincaid, but how does it stack up against Bob’s Daveart creation? Let’s take a closer look. 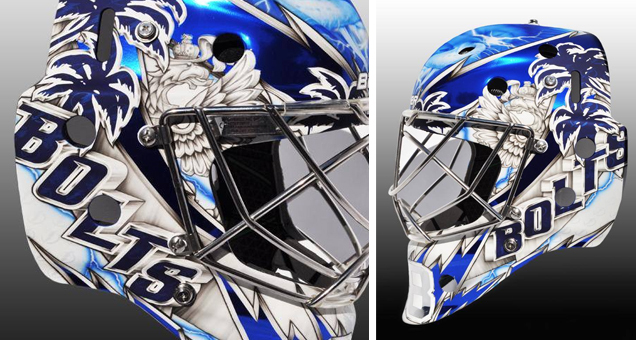 Vasilevskiy’s mask has been pretty consistent over the past few seasons, first garnering attention for its use of color changing subzero paint, but also for artist Sylvie Marsolais’ artistry and skillful execution. With bold palm trees and faux-chrome detailing combined with soft gray airbrushing, Marsolais has really established a signature look for her client that stands out in the league. At the other end of the ice, Bobrovsky too has had a somewhat consistent theme to his bucket in recent years. 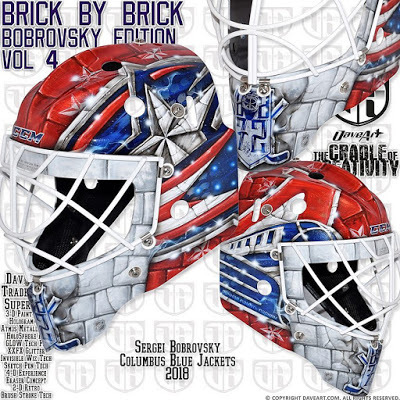 Now on volume 4 of his “Brick by Brick” series, the latest iteration pays tribute to the players in Jaroslavl who were lost in the 2011 plane crash. 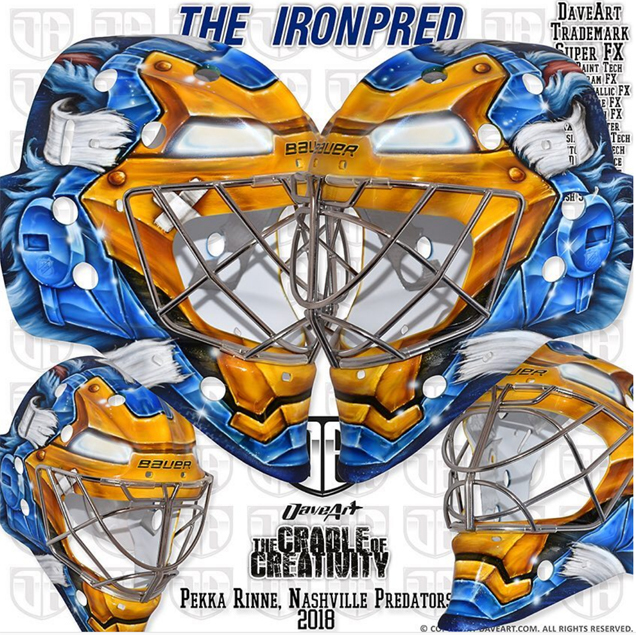 The sentiment behind Bob’s mask is certainly touching, however going off pure aesthetics, it’s hard to make a case for anyone but Vasilevskiy taking the cake on this one. The dynamic composition and flawless execution make this bucket a hard one to top. 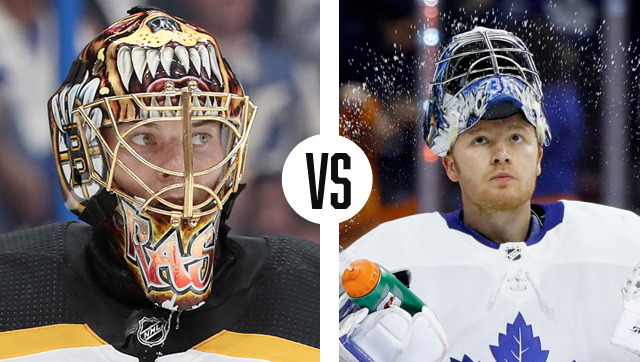 Stop me if you’ve heard this one before… Tuukka Rask and the Boston Bruins are taking on Frederik Andersen and the Toronto Maple Leafs in the first round of the playoffs. No, you aren’t accidentally re-reading the 2018 Bucket Bracket Showdown––these division rivals and two of the league’s top teams are meeting again for a chance to advance to the conference semifinals. 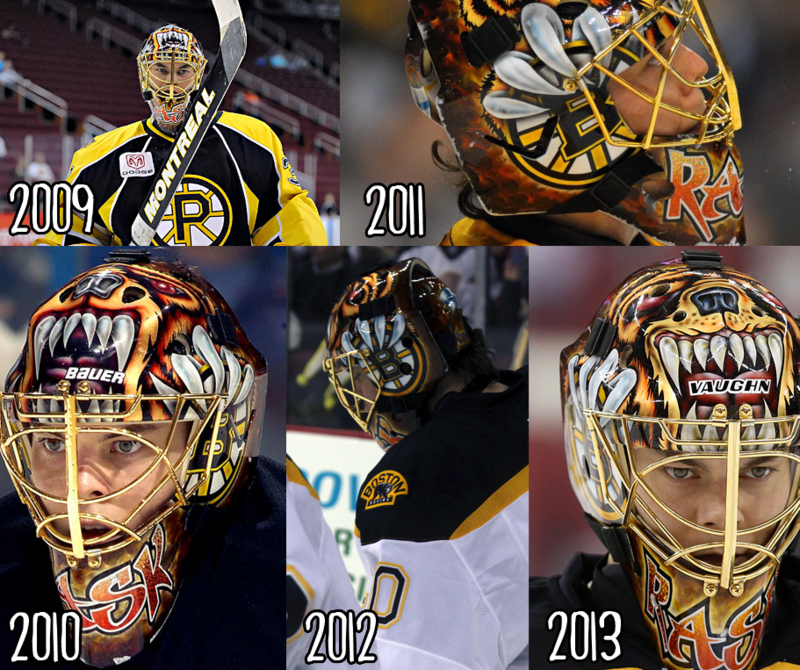 Like Rask, Andersen too stuck with what worked in his string of Batman-themed buckets. Titled “The Blue Knight Returns, Vol. 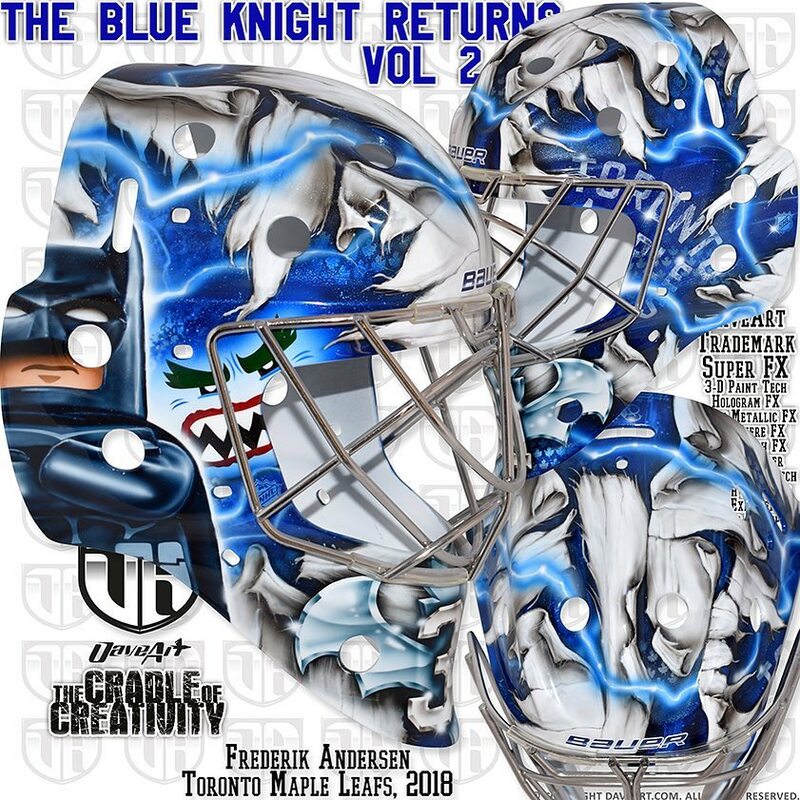 2,” the fabric tears in this design reveal blue leaves on each side of the mask alongside Batman on the right. 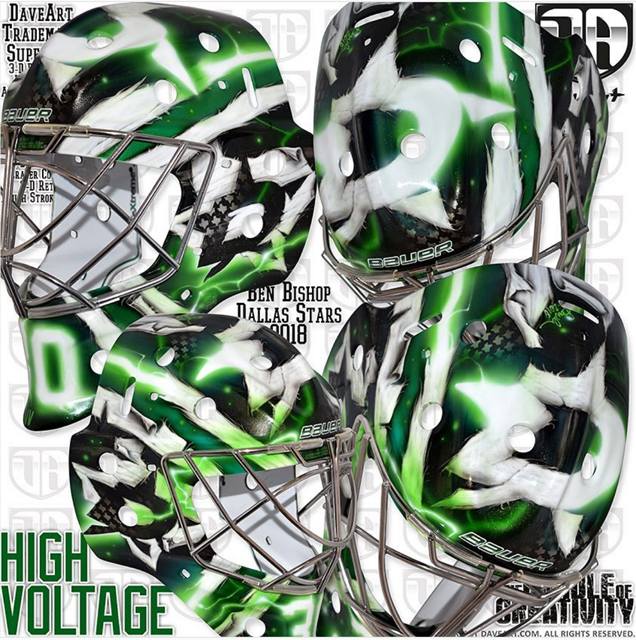 Like all Daveart work, this design is jam packed with lightning rods, holograms and fine detail that keep your eye moving throughout the mask. 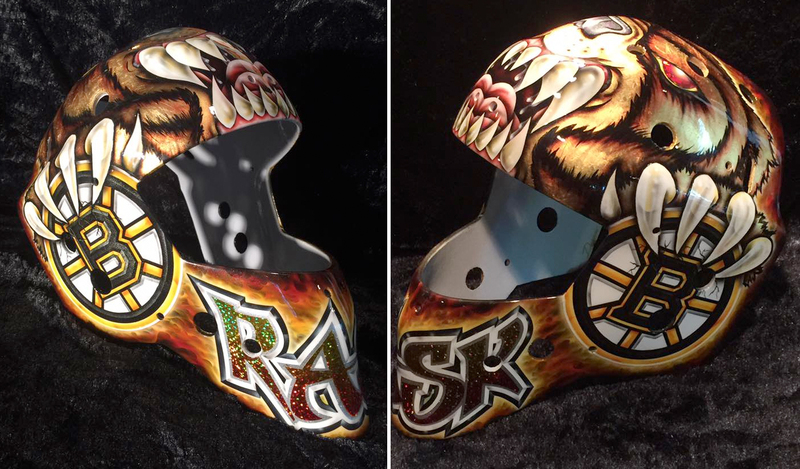 While Freddie’s super detailed bucket is certainly impressive, the bold and classic look of Rask’s edges him out with a game to spare. Death, taxes and Daveart-versus-Daveart bucket matchups in the playoffs. 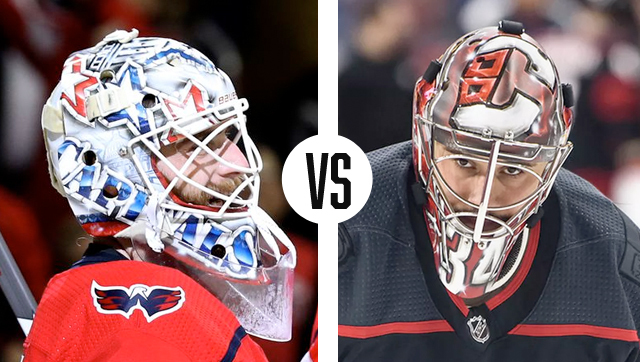 This Metro-division showdown brings us reigning champion Braden Holtby taking on a surprising opponent in Petr Mrazek and his Carolina Hurricanes. 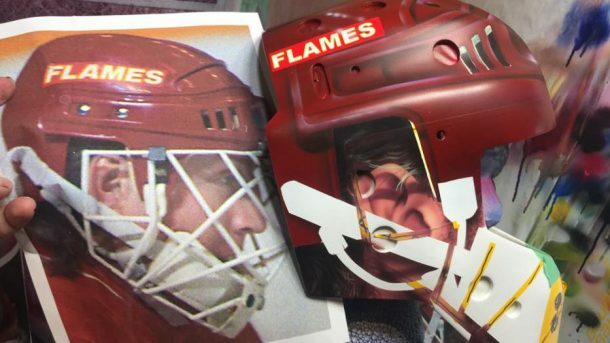 Both of these netminders take similar approaches to their masks, not only in working with the same artist, but in centering the designs around their respective teams’ branding. 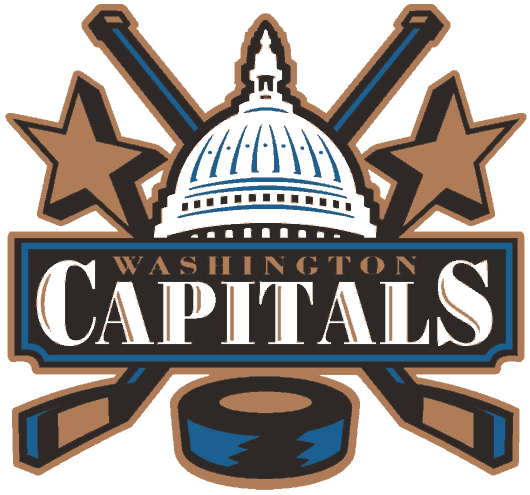 In the Capitals’ net, Holtby’s latest bucket uses military-style typography and the team’s retro Capital Building logo along with red and blue stars to fill the foreground, while the negative space is peppered with ghosted logos to add depth and visual interest. 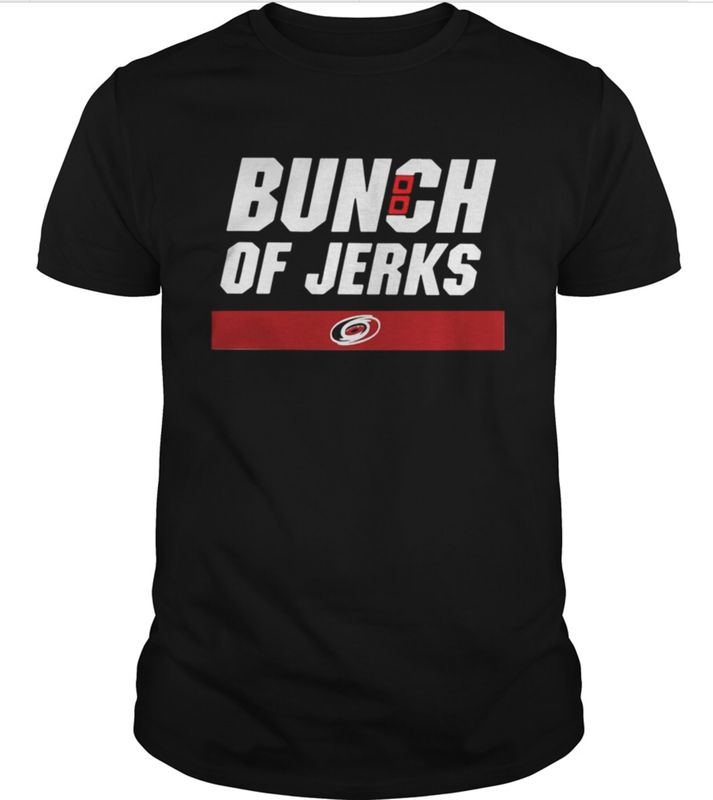 Mrazek has both white and red editions of what Gunnarsson calls “Canes 2.0,” with the team’s alternate flag logo on each side and large C on top laden with inset hurricane flags (the typography now more famously known from the “bunch of jerks” tees). Despite the similarities in these masks, Mrazek’s takes a much bolder and more graphic approach with fewer large design elements, versus the numerous, busier details in Holtby’s. 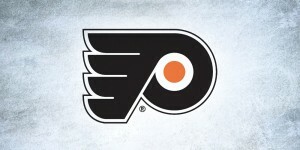 With the superior legibility, Mrazek and the Canes pull off the upset and knock out our defending champ. 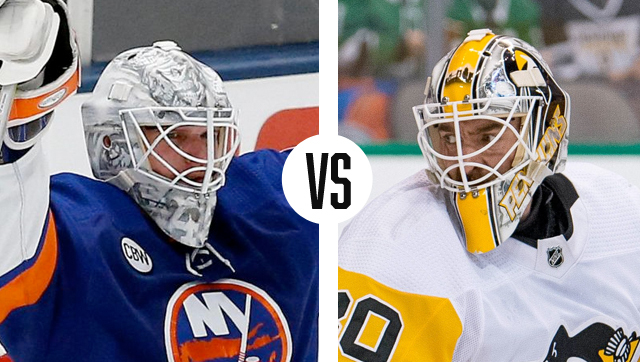 Well this sure is an unexpected one… former BBS champion and regular player in the showdown, Matt Murray, is in an underdog spot this year against Robin Lehner and the pajama boy John Tavares-less Islanders. 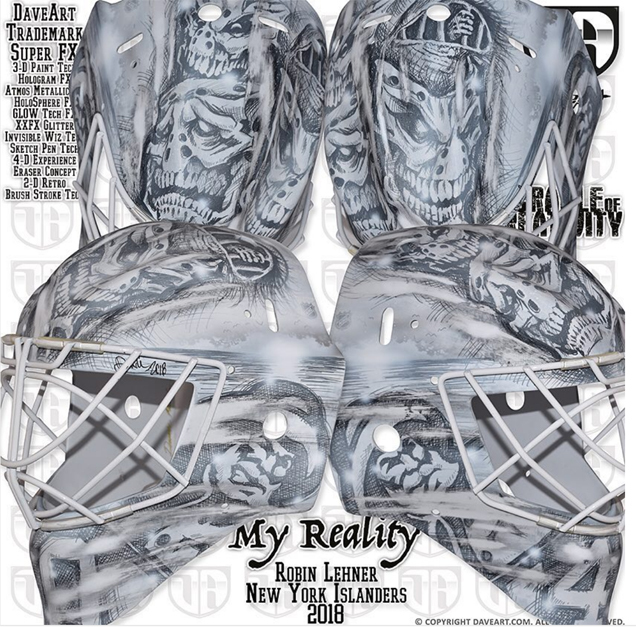 Lehner’s mask, painted by Dave Gunnarsson, garnered attention at the start of the season for the moving inspiration behind the design. Titled “My reality,” the concept illustrates the netminder’s battle with mental illness and his fight for a better future. As the artist shared when it was first revealed, “the top of the mask describes how Robin’s reality has been for years. The most important part of mask is the sides, there is the sun at dawn describing the start of the new life for Robin when he decided to seek help for himself and his family.” Gunnarsson also added how meaningful working on this mask was to him personally, as he too has struggled with overcoming anxiety and panic attacks. 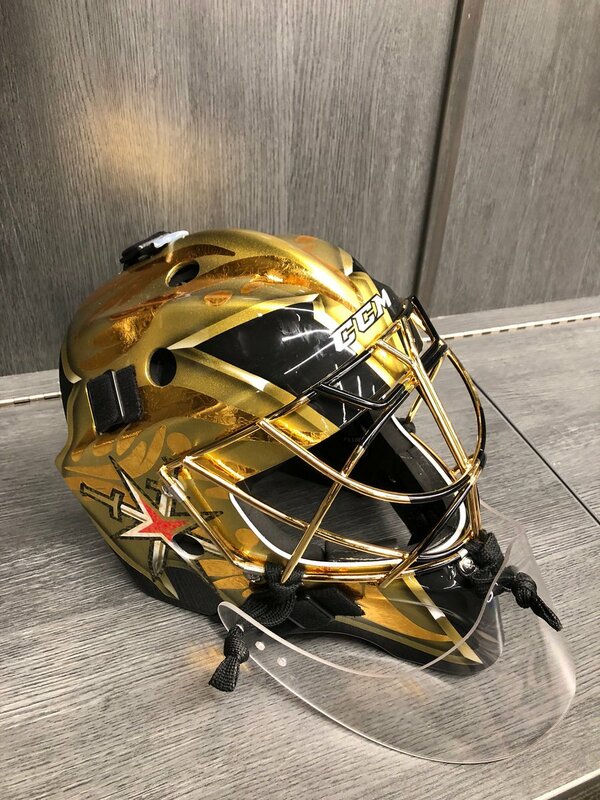 Murray’s bucket earned a B in our season Eastern Conference preview, and while the paint job is clean and there’s not a whole lot wrong with it, the powerful imagery and creativity in Lehner’s gives him the edge. While Rinne’s may be out of the box and a little abstract, Bishop’s bucket leaves no questions with a high-voltage design. A continuation of a style he established while in Tampa Bay, the electrifying design feels slightly less relevant as a member of the Stars, but it’s visually no less impressive. Switching to a darker background, the green currents and white logos really pop and make this a really exciting design to look at. 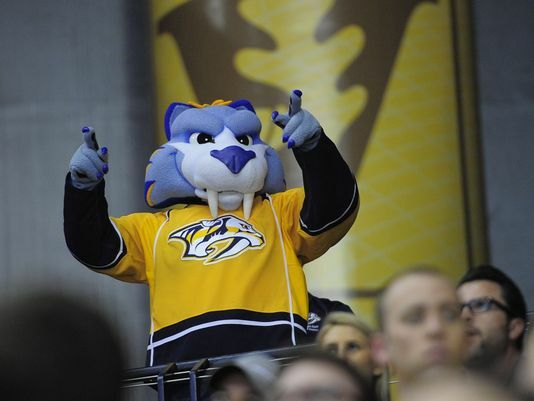 This one gets taken in a landslide. 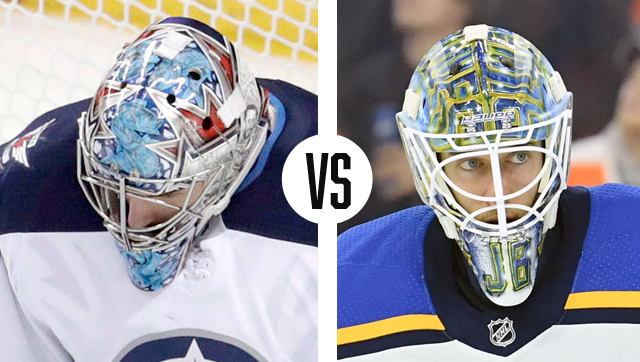 Next in the west, we have one of the league’s best goaltenders for mask style in Connor Hellebuyck taking on an opposing netminder and team that probably no one saw coming; rookie phenom Jordan Binnington and the St. Louis Blues. 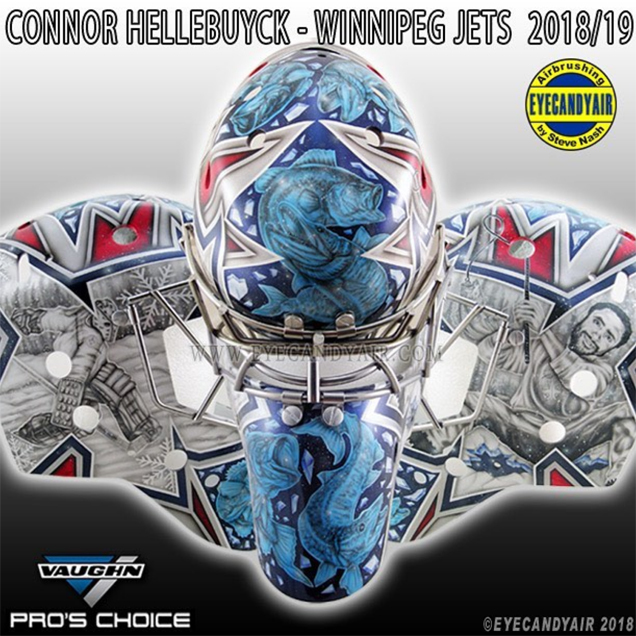 Painted by Steve Nash of Eyecandyair, Hellebuyck’s latest bucket received an A+ in our preseason mask preview for its flawless combination of artistic beauty and humor. While many goaltenders take a cheeky or humorous approach to their mask design, Hellebuyck and Nash do so on this mask through incorporating an illustration of Dustin Byfuglien ice fishing with a dynamic composition, smart color theory, and meticulous artistry. Across the ice, newcomer Jordan Binnington has taken the league by a storm with his ability to step in and backstop the Blues after a rocky start to their season and rotating carousel of goaltenders. Unlike his play between the pipes however, his Daveart bucket is unfortunately pretty underwhelming. 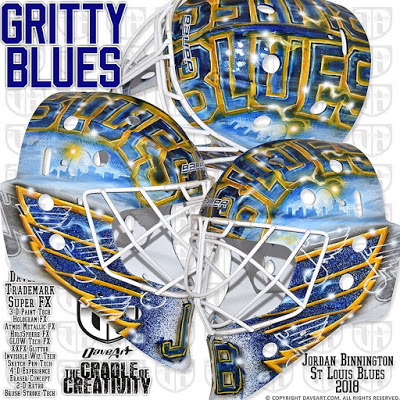 Titled “Gritty Blues” (no, not that Gritty), this design is about as generic as they come, which is somewhat expected from a rookie goaltender who’s yet to find a signature gear style. 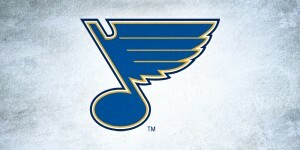 This one goes to Winnipeg with no fight by St. Louis. 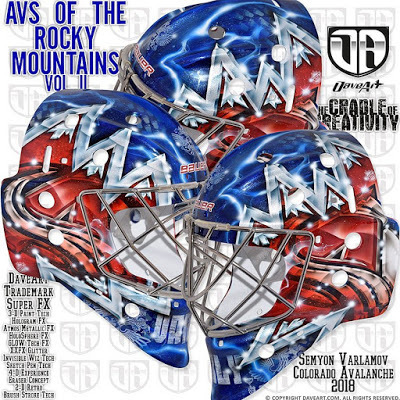 In net at the other end, Semyon Varlamov’s mask has nothing retro about it. A quintessential Daveart design, Gunnarsson was inspired by the Rocky Mountains and added his signature touches of chrome accents, holographic logos, and loads of layered detail. 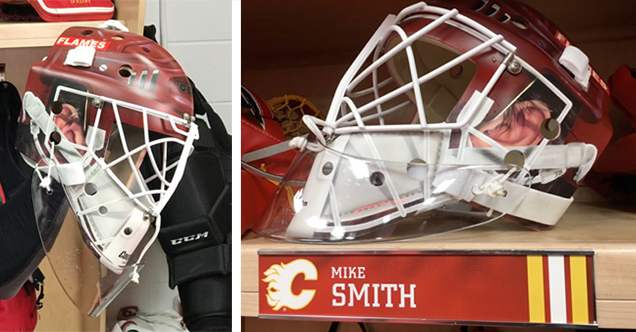 In comparing the overall aesthetic value, nostalgia, team branding and innovation factor of these two, it’s hard to give anything to anyone’s but Smith’s. The way in which Arrigo executed this mask is perfection and takes the series in a landslide. 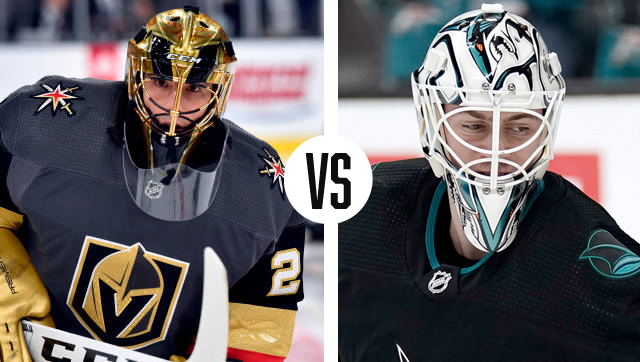 In a battle of Sin City flash versus Silicon Valley crispness, Fleury’s Golden Knights bounced back after a rough start to the season to now take on Martin Jones’ San Jose Sharks in the first round of the playoffs. 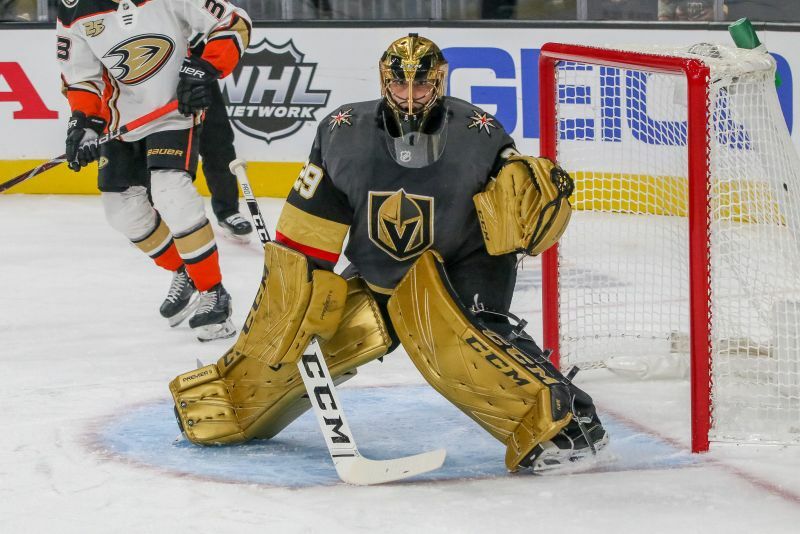 Back with a metallic foil mask to match his gilded pads, Flower and artist Stephane Bergeron crafted a beautiful and graphic follow-up to last year’s cluttered design. With a black V on the front mimicking the Vegas logo, the rest of the design is gold-on-gold foil. Framing the mask is the Knights’ alternate logo on the right, and “Vegas Strong 58” on the left, for those who lost their lives in the tragic 2017 shooting. 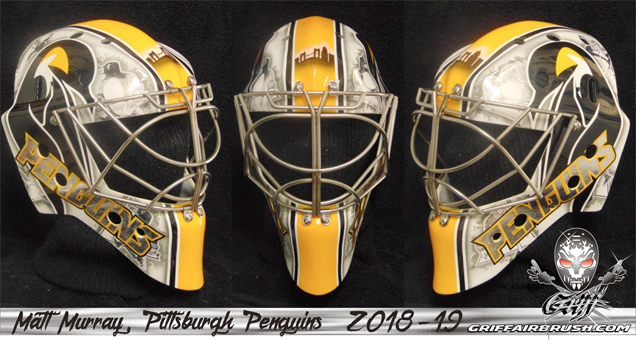 Unlike his inagural Vegas mask, the minimalist composition of this design balances out the abundance of metallic gold. Across the ice, Jones’ Eyecandyair bucket has far less flash but is no less impressive. Artist Steve Nash is a master at creating layered, collage-like compositions that appear simple yet are perfectly balanced, well thought out, and flawlessly executed. 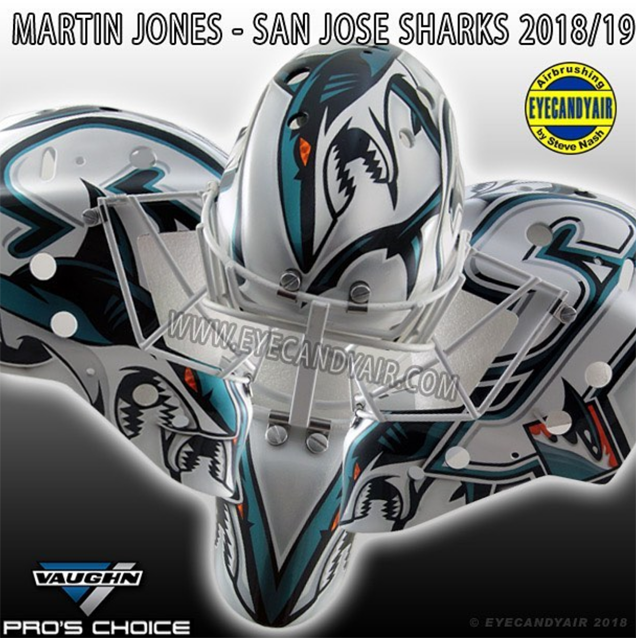 The way in which the two sharks along each side of the chin come together in the center to make a perfect V is both beautiful and mind-boggling, and the touch of flash in the metallic foil eyes is just enough to give the design some flair. This is a tough one, as these masks are so different yet both so perfectly executed, but the flash of Fleury’s edges out Jones by the slightest margin.